Through the applications related to these services, it's easy to access and watch all of the content you want. It provides video in fast 1080p HD streaming that is also buffer-free. MPN 3910RW. Audio/Video Outputs HDMI. Open Box - Certified by The-Open-Box. The item may show signs of use which may include markings, scuffs or light scratches. Includes all essential accessories for the item to function. Let us know what the issue is and we will help you as best as we can. The Roku Ultra is our top-of-the-line player with a powerful quad-core processor, our best wireless, and an Ethernet port, for ultimate connectivity that stands up to what you want to stream. Whether you're watching in HD, 4K Ultra HD, and HDR, you?ll get picture quality that's optimized for your TV with crisp detail and rich color. Trending at $69.90eBay determines this price through a machine learned model of the product's sale prices within the last 90 days. Model Number: 3810R. 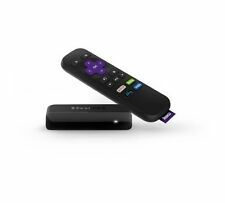 The Roku Streaming Stick allows you to stream over 500,000 TV shows and movies up to 4K resolution. An advanced wireless receiver gives you 4x the range and a stronger signal for smooth streaming. Model Roku Premiere. 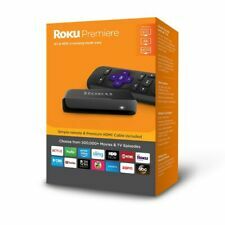 Product Line Roku Premiere. Model Number 4620rw. Manufacture sealed. Roku 3 (3rd Generation) Media Streamer 4200X - Black. Used. Bought new TV with Netflix already built in. Ships via USPS Priority Mail. Roku Premiere 3920R 4K Streaming Media Player - Black. Shipped with USPS Priority Mail. Condition is New. LOT# 201709. 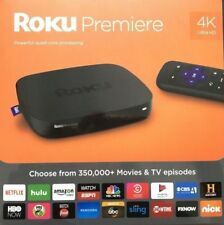 Roku Premiere (5th Generation) 4K Media Streamer 4620X - Black. Works perfectly with no issues. Has a direct tv now button, amazon prime button Netflix button and pandora on the remote. Condition is Used but excellent. Shipped with USPS Priority Mail. If you have that one TV in the bedroom you’ve wanted to upgrade, the black Roku 3900RW Vudu edition will do the trick. The included infrared remote is simple for anyone to use, allowing you to browse and search online easily for your favorites. WiFi or Ethernet connection. High quality HDMI cable. Roku Streaming Stick Digital HD Media Streamer (3600R) - Black. Like-New - opened but NEVER used. Box has slight remnants where a sticker used to be (see photos). Because this item was not used and still has original packing on the instructions and battery saver tab on remote we will not accept returns. Please review the photos. Everything you see in the box in the photo is included; Roku stick, remote, ac cord, batteries (which are a couple years old). Product never taken out of the package, just sat on a shelf. The 2016 Roku Streaming Stick delivers fast performance with a quad-core processor and dual-band wireless. Plug it in, connect to internet, start streaming. High Speed HDMI Cable. Composite cable. 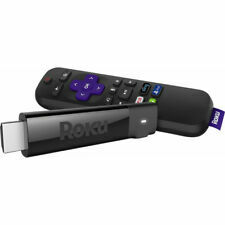 ROKU 3600 Streaming Stick. Stick is in Very Good Used condition. After 3, the rest are free. All Parts Included (See Photo). ▪Roku 1(2710x) was developped and introduced on Sep 2013 after Roku 2 XS, XD. ▪Also Roku 1 (#2710x) equipped with big devices so heat spreading is better. So Roku 1 (#2710x) has value for money. Also this Roku 1 is better than any sitck version because stick version is too hot and high temperature when working but This Roku 1(2710x) version works smooth and stable. ▪Roku OS is based on Linux OS, so Roku just has a little bit cache and run lightly fast, this is quite better than any other OS. Best in the TV set top industry ! Nice condition, Grade A, fast and good working status, tested for basic power. Roku LT Streaming Media Player. Shipped with USPS Priority Mail. 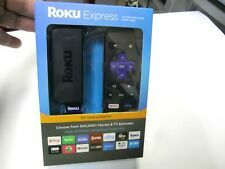 HD Streaming TV Box Roku Express 5X More Powerful Free Mobile App Media Player. Condition is New. Shipped with USPS First Class Package. Roku Ultra 4661X 4K HD Media Streamer - Black. Shipped with USPS Priority Mail. 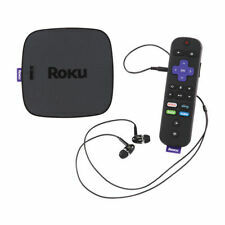 ROKU LT Streaming Player. Model 2400D. New in Box.